Slimmers: Did They Really Keep The Weight Off? This program tracks down six extraordinary weight loss champions - who lost 80 stone between them - to find out what happened next. After they collected their prizes and the press photographers left, did they manage to keep the weight off? At a time when 60% of people in the UK are overweight, a ground-breaking science study on one weight loss hero reveals the body’s incredible but little known biological response to dieting that sabotages our efforts to keep weight off. On Tuesday 14th February Channel 4 at 8pm. Philip Glenister and Ant Anstead reunite for a one off special. 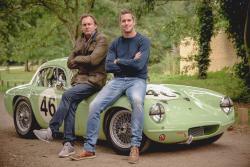 This time the boys decide to restore a Lotus Elite, a classic of 1950s British motoring and the first road car designed and built by Formula 1 genius Colin Chapman. Ant promises the seller that he will not only restore the car but enter it into the biggest classic car race of the year in only ten weeks. Beginning Sunday 20th November 2016 Channel 4 at 8pm. Formula milk plays a role in almost every British baby’s diet – but how much do we know about the industry we trust to feed our children? Kate Quilton meets the infant feeding specialist who says expensive brands are “nutritionally equivalent” to cheaper rivals, the desperate mum watering down her baby’s milk to make ends meet, and the formula company CEO who admits his industry needs stricter regulation. With new research which shows how far formula influence reaches into the NHS and leaked documents which reveal how clever marketing helps firms make millions from parents, Dispatches asks whether this industry is putting profits before babies.New mum Kate Quilton asks if formula milk is being priced fairly, and whether claims made for it are unbiased and scientifically accurate. 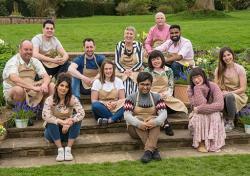 The Great British Bake Off returns with five special Stand Up to Cancer episodes. In each episode Sandi Toksvig and Noel Fielding are joined by four different celebrities. 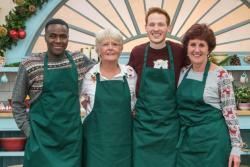 They’re all aiming to impress judges Paul Hollywood and Prue Leith with their baking skills, but only one celebrity each week will be awarded the coveted star baker apron. 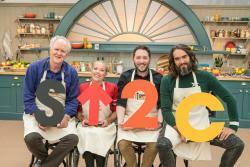 On your marks, get set, bake for Stand Up To Cancer. Liam and Flo from the 2017 Bake Off, and Jane and Andrew from 2016's show visit the tent. Plus The Darkness perform Christmas Time (Don't Let the Bells End). Liam’s love for baking is built on his belief that it can be super easy, it’s really creative and anyone can get into it. 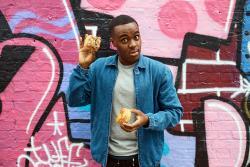 Bringing a fresh perspective to baking with recipes that blend pop culture, nostalgia and his own Jamaican heritage, Liam’s on a mission to show us all that no matter what your skill level there are recipes for everyone. Yes there are rules, but when it comes to flavour and texture, there are no boundaries. Each week, host Jo Brand will be chatting to a panel of celebrity Bake Off fans, looking at all the shenanigans & goings on in the tent. Jo will shine a spotlight on the best, the worst & the ‘must try harder next time’ bakes from the latest episode, with chat, exclusive footage from the Channel 4 show and an interview with the baker who left the tent that week. This long, hot summer sees twelve new amateur bakers don their aprons and head for that iconic white tent, in the heart of the British Countryside. Judges Paul Hollywood and Prue Leith return, having set 30 brand new challenges to test our bakers skill, expertise and flair. From bread to biscuits, Parisian-style patisserie to Danish delights, childhood classics and beautiful vegan creations, each challenge showcases clever techniques, fabulous flavours and intricate designs. Noel Fielding and Sandi Toksvig will again be with the bakers every step of the way, offering an encouraging word and, sometimes, a shoulder to cry on. Judges Paul Hollywood and Prue Leith return, having set 30 brand new challenges to test our bakers skill, expertise and flair. From bread to biscuits, Parisian-style patisserie to Danish delights, childhood classics and beautiful vegan creations, each challenge showcases clever techniques, fabulous flavours and intricate designs. Noel Fielding and Sandi Toksvig will again be with the bakers every step of the way. Judges Paul Hollywood and Prue Leith return, having set 30 brand new challenges to test our bakers skill, expertise and flair. Two teams of model flying aces from Britain and Germany come together to bring to life the greatest aerial conflict in history. Using laser technology that enables their planes to shoot each other down, they explore three crucial days of combat to illustrate the tactics, technology and heroism of the battle. The passion of model plane enthusiasts brings a fresh perspective to what Churchill called 'Britain's finest hour'. 3 episodes starting 9th September 2018, 8pm on Channel 4. Two teams of model flying aces from Britain and Germany come together to bring to life the greatest aerial conflict in history. Using laser technology that enables their planes to shoot each other down, they explore three crucial days of combat to illustrate the tactics, technology and heroism of the battle. The passion of model plane enthusiasts brings a fresh perspective to what Churchill called 'Britain's finest hour'.